Bosch has a permanent fix for this problem and will cover the cost of the part. They will only cover the cost if it is installed by one the Bosch Authorized Repair services. I was able to take the door in to the repair shop for a flat price of $50 for them to install the kit. Step 1: Call around to a Bosch authorized repair center till you find one who will do it for a flat fee. Step 2: Call Bosch and tell them you have been having the door problem since you bought it and want fixing kit that was designed to correct the manufacturing flaw. They will ask you to send a copy of your receipt for the stove. When they agree to cover the parts only tell them to send the order to the shop you have an agreement with for carry in service. I used Jamie's fix years ago but it eventually failed again. The fix kit has reinforced steel plates tack welded to the inside of the liner where the hinges attach. You can buy kit and do it yourself $175-$211. Or Have Bosch cover the part and do an in home. Good information. Personally - the fix I made back in '09 is still working fine for me. This solution seems fairly inconvenient and/or expensive (either you have to take your door to an authorized service center, and/or pay $175+!). But it's good to know there's at least a real fix available if this "hack" fails eventually. Frankly, it's pretty crappy that Bosch won't just send you the hinge so you can install it yourself for free in 10 minutes. How generous of them to agree to pay to replace their defective part after five years of ignoring the problem.. but only if you pay them to install it!! So this doesn't really do anything to change my opinion of the lousy quality of their customer support. But still, good to have options. In the nearly 4 years since I posted this problem, I've gotten over 80 comments, thousands of views, this page is the #1 google search result for bosch range door and on the first page for lots of important variants such as bosch range problems. You know how many times someone from Bosch has tried to contact me, commented here, or even addressed this issue in any public forum? It's 2009. Oh wait. Now, it's 2013. Wake up. Your potential customers read this stuff. This is bad press. It could have been good press if you responded to it, ever. This is going to be one of those posts that most of you should skip, now, unless you happen to have a Bosch range on which the oven door doesn't close properly. I have a Bosch HDI7282U 30" slide-in range which I bought new about two years ago. A few months ago the oven door stopped closing all the way, preventing a good seal. This caused a lot of problems, not the least of which is half the heat goes into the kitchen instead of staying in the range. Uneven cooking and verrrry long preheats was a consequence. While the range is probably still under warranty, my online research into this problem told me that I was far from alone. At least it's a common enough problem that others had discussed it in a few online forums. Unfortunately there was no good resolution that I could find, and those who had dealt with Bosch's service (even under warranty) did not get satisfaction. Can't say I'm excited to hear about that since I own three Bosch appliances. But I finally got around to trying to figure this out myself, and came up with a good solution that is simple and takes about 15 minutes. Start by taking off the range door. To do this, open the door all the way and flip the hinge-locks toward the door all the way. 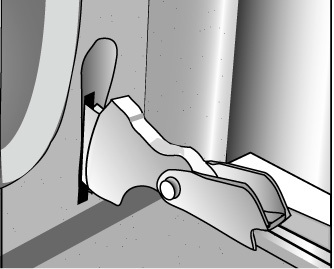 The two pictures below show the hinge in the normal position (left), and the locked position (right) needed to remove the door. Complete instructions are on Page 48 of the manual. You can also download the whole manual here -- I assure you it is a riveting read. Once the hinge is in the locked position, you can basically just lift the door up an pull it out. The hinges have a little slot on the bottom and are cantilevered against a pin on the top. So you raise it up about 1/4" to clear the slot, and pull it straight out. 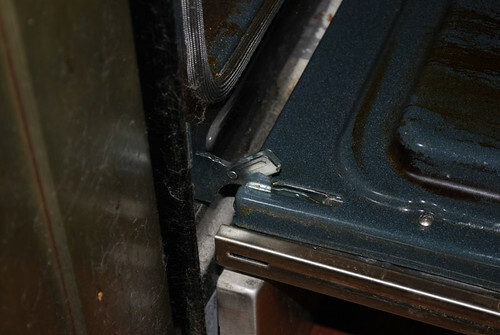 Below is a picture of my oven door with the hinge in the locked postion. 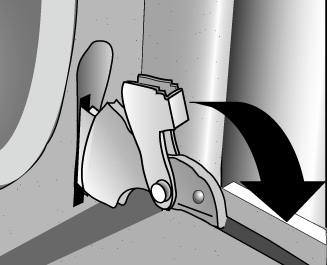 You must tilt the door to a 45 degree angle with the hinge locked before removing it. Do not try to close the door all the way with the hinge locked. From this position, just raise the door vertically about 1/4", then pull it horizontally awayfrom the oven. To do this you need two torx wrenches, a T10 and a T20. There are four screws holding the inside of the door to the outside, and three screws holding each hinge onto the door interior, for a total of 10 screws. Their approximate positions are circled in the photo of my door below. Yeah, it's pretty gross, and that's AFTER I cleaned it. Remove all the screws. When you take off the two at the top, be aware that the handle will no longer be attached to the door. You're not going to do much now except put everything back together, with one minor adjustment. I'm not quite sure exactly what's causing the change in dynamics here resulting in the door not closing - either the hinge isn't quite right any more, or the pin inside the range itself that the hinge cantilevers against moved slightly. I saw no evidence of anything bent on the hinge itself so I am guessing it's the pin. Accessing this looks like a big hassle, even if it could be adjusted, so I went for a different solution. To correct the problem, all you need to do is change the dynamics of the door so when the hinge is in it's "closed" position, the door once again is shut all the way. The simplest way to do this is to add some space between the back of the hinge and the door at the top of the hinge. In th picture above, you may be able to make out a couple little washers on the counter behind the hinge. Re-attach the hinge to the door interior, but put a couple washers between the large screw and the hinge itself. I used two washers on each side like the ones above, adding a little less than 1/8" of space. This results in a significantly bigger difference at the top of the door, and was just right to cause my door to close snugly. After you've re-attached the hinges with your spacer, completely attach it using the two small screws for each. Put the door interior back over the door exterior, being sure to line everything up correctly. There are three tabs on the bottom that should go inside the interior, and make sure the handle is correctly positioned before tightening the two screws at the top. After it's completely reassembled, simply put it back on the range, open it all the way, and return the hinge locks to the open postion. You're done. 3-year Thanksgiving update (11/20/2012): some early commenters wondered how long this fix would work. I am still working on the original fix and the door is still quite snug. Commenter #69 gives a very believable explanation as to the physics at work and why this happens in the first place or might fail again. Perhaps the pin can only bend so far in the way this is set up on the Bosch and in my situation it's reached that point. But I have not had any further trouble since I originally posted this fix. Hi Jamie. I'm a reporter for The Washington Post doing a story on Brightest Young Things (I know, gag, etc). Noticed your post on them, and want to talk further. Nothing serious; just looking for people who don't buy into what they're doing. Can you e-mail me at zakd@washpost.com? Thanks. Thanks for your recommendation. Worked like a charm. I have a bosch dishwasher which is great. money next time for viking or LeCornue. Glad that this was helpful. Personally I like the range overall. But compared to the dishwasher which is perfection in design, I agree it's not up to the same standards. Some stupid stuff, like the way the cooktop meets the edges which is hard to clean. But at the same time I'm not sure what would be better for around 2 grand, ain't getting a viking for that money. Its a few days before Thanksgiving and I think my wife would kill me if I tried this repair before Thursday. But over the long weekend, for sure! Thanks for describing the problem and your fix so well, and simply. I'll report back on success or failure. Regardless, Thank You! jamie, great info on this problem that seems to be an issue with many of these ranges. i haven't tried it yet, but it looks like what i've been needing. i'll post a followup after i get it done. Your solution worked perfect and easily! I had been tinkering with the door for about a week before seeing write up. It seemed that the springs on the hinges had settled/weakened after enough heat/cool cycles and I wasn't sure how to fix that. Your method is great and much easier than what I would have probably got myself into! Great Solution! Mine also works - I called Sears, where I purchased the stove. They are completely out of stock of the hinges because so many people have this problem. Since they can't replace the hinges within a reasonable time they are allowing me to buy a new stove with the original amount. Free deliver, pickup and installation. Ran a self cleaning cycle a month ago and the door never closed again. Today I used your instructions to add about 3/16 to the top of the hinge and it worked well. Thanks for the post. Before I went with your easy fix I called Bosch in Huntington, Ca. They told me I could purchase the hinges for $166 each but they offered me 50% off that price so all in I would pay $166 for both. Additionally I was told that there was a sub part number on the sku, meaning they had addressed the problem with a upgraded part. Shame that Bosch had to lose me as a customer for life because they were too cheap to recall the defective part. But what should I expect form a $2300 purchase. 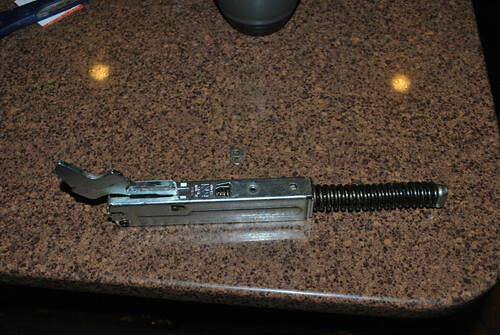 BTW- I got a quote on a service call- $130 for the call and $186 per hinge to replace. This would have cost me over $500 bucks from a Bosch authorized dealer to fix a problem that ultimately cost me 8 cents worth of washers and a half hour of my time. I have to say that as much as I have found Bosch generally makes very high quality products (I own several bosch tools as well as appliances), everything I've read about the corporate response to this problem has been bad. Before I figured this out myself it was discussed in several other places online and everyone pretty much reiterated your experience. Even under warranty, Bosch apparently was unable to fix the problem for some customers. This is really poor form for a company with a generally good reputation. Yes, the hinges should be recalled, or at a minimum free replacements should be offered to anyone who wants them. Even if the labor was not included this would in my mind be a reasonable compromise. But to expect us to pay upwards of 1/4 of the cost of our (very expensive) range to deal with this obviously common problem is really poor form. I am also sorry that anyone Bosch has not decided to get involved or comment on this blog or anywhere else. If you google "Bosch Range" this post is on the second page. If you google "bosch range problems" this post is on the first page. There is no question that potential customers will see this and read about what they can expect from Bosch. Even if they only care about the bottom line, they are foolish to ignore this problem. It's really too bad that they don't care more about their customers - with or without the threat of bad PR. It's lucky for us that there's an easy, essentially free fix. But we shouldn't have to resort to "McGyvering" a solution to such a basic problem on a very expensive appliance. We will not always be so fortunate. Hey - Thanks a ton. Worked great. You are right that it takes about 1/8 inch on each side. I first tried with just 1 thin washer and it was not enough. HINT: I cleaned the top surface around the threaded hole with some alcohol and the 2 washers to remove the grease. Then I put a small drop of super glue on the first washer and placed it on the hinge. waited 20 seconds and then did the same with the second washer. Now I had 2 stacked washers that were attached to the hinge. Very easy to reinstall from there. Thanks for this post. I decided to do a search today to see if anyone else had this problem. Very disappointed in the product. Will not recommend or buy Bosch again. I'll give your fix a try and hopefully get the temperature in the kitchen back to normal when we make pizza (500 deg cooking temp)! Thanks again. Dood, thanks for the post! Few things in life needle me as bad as coming home to a new $2,100 range that I have to prop a chair against when using. I'm going to try your fix. Jamie - Thank You so much for this fix. Just fixed my Bosch Oven Door that even new hinges didn't fix. I also urge everyone with a Bosch Oven door problem to file an on-line Incident Report with the Consumer Product Safety Commission as this is a fire or burn injury time bomb. Thank's again for sharing the fix. I tried this fix and it worked great initially. After several more months of heat/cool cycles it seems that the springs have relaxed once more and the problem has returned. Heat escaping and ruining the knobs. Mine is still doing fine a year later, I guess I would just try taking it apart again and adding some more space. It could very well be this just isn't going to be a 20 year fix and at some point the hinges will need replacing. Though I am still not convinced the hinges are the problem - I remember reading in some forum that someone had had theirs replaced under warranty and it didn't fix things. I originally theorized it could be the actual catch mechanism that the hinges hook onto that has bent or moved, if so then there might be a different approach required if it keeps getting worse. Found your posting and implemented the fix this morning. Seems to work well. Great and simple fix! A comment on "engineers" - I was an engineer for over 30 years, and a considerable percentage of those I know/knew would never admit to a problem with their designs. They would defend poor/unworkable/flawed designs to the nth degree, rather than admit something was wrong and fix the problem. I'm sure the Bosch engineers aren't much different from those I worked with in other industries. The wife and I have the same problem with our Bosch oven door; I should say had the problem. The fix worked and it was very simple to do. The only halfway hard part was getting the screw with the washers started. I wish consumers in the US would be more demanding of their elected officials. Consumer rights are a joke here and not taken seriously by our legislators. Thanks for taking the time to pic and post your remedy to this agonizing problem. I have had nothing but heartache from my spouse for 4 years on the leaking door. With your recommendation it was fixed in 45 minutes....and now closes perfectly aligned and leak free. Bosch and Thermador need a lesson in customer service - several calls to them and local customer service were not helpful. Clearly it is a design problem that should have been rectified - I don't dare calculate how much energy I needlessly spilled over the past 4 years. Thanks again! Jamie. Can't thank you enough. What an elegant solution for the problem. Very disappointed in Bosch, everyone else has said it for me. OK I just repaired the gap on ours, it has been leaking about 1.5 years. I used 3 #10 washers, measured the thickness of the stack with a calipers and it was 0.145 inches or just about 2.3 sixteenths. Thanks Jamie for the post. The door seals really well now. One piece of advice, when you pit it back together go around the oven surface where the door closes, and re-expand the silver gasket material. So you get a good seal with the door in its new position. I hope it lasts, sounds like it has for almost everyone. I also filed a safety complaint as suggested here in an earlier comment, Bosch should not get away with no public record of their denial of an obvious design flaw. Worked great. Thanks! Used 3-#10 washers, super glued them together, screwed the hinges, with spacers, to the door, then screwed it to the door front and handle. Installed the door and it's much tighter now at the top. Can't wait to bake some bread. I have a Bosch HDI7052U/03 dual fuel range with the same issue. I figured I would try your solution over the weekend but decided to just see if I could get the door off now. I did and put it back on and amazingly the door shut correctly! I'm sure it won't last but others may want to try it if they need a quick fix. You are kind to have posted this. Thank you! I love Google search for tracking this down so easy!! And they host the blog! This is a sign to buy stock! I just did this fix, Thank you so much!! My wife was fed up and talked to a well recommended tech. He did some research and came back with $300+ (part & labor)fix of replacing the inner door panel. I used 1/8" washers and secured them by threading through the screw that holds the hinge to inner door. Took about a 1/2 hr, would have been 15- 20 min. but I let the kids help. thank you thank you thank you...2 years of angony with this stove and hassles with the hubby and today i finally got him to attack this problem and with your suggestions, it now works!!! i am so upset that i paid so much for a product that the company wont or cant fix but with an hour of our time.your knowledge and suggestions and 6 washers and it closes tighter than it ever has!!! my husband says he owes you a beer or two!! thanks again! Thanks, I used 3 washers and worked like a charm!!!!! The fix has worked for me today. 3 washers did the trick. We'll see how long it lasts. The vendor I bought it from says he's never heard of this issue...and they are a pretty good dealer so I am surprised. 1.5 years since I posted this and still getting lots of comments! This is certainly a very common problem and I can't believe any dealer would not have had it come up before. I would have hoped someone from Bosch stopped by in that time to comment on the issue. I'd be interested in hearing from people about the longevity of the fix. In my own case, it's still about 90% - it doesn't close *quite* as snugly as when I first did it, but it's still making a decent seal and I see no need to address it again at this point. Also, I use my oven about once a week for pizza (at 525 degrees) so I'm pretty hard on it. I've had this hinge problem since day one. At first I thought someone may have leaned on the door when it was open and bent something. We've had the range for almost 3 years, and finally today, I thought, I'm going to do something about this. Poked around on the internet and found your fix. Made sense to me. Works like a charm Jamie. Thanks for saving us time and $$'s. Regarding your last post, perhaps a new door gasket would help snug things up a tad since you seem to use yours quite a bit. On this same range, I had a problem with the fan (mounted behind and at the top of the rang) that vents between the top of the oven and under the burners. Again, since day one, very noisy. Read where replacing the motor does no good since the replacement motor has the same issue. The ends of the motor/blower shaft are supported by loose bushings with loose tolerances. I found that if I just put the slightest pressure on the ends with my fingers, it quieted things right down, so I had to figure out how to accomplish that. I purchased 11 inch stainless steel cable ties, and piggybacked two together and ran it around the entire motor/blower assembly making sure they contacted the bushings on each end. Problem solved and the wife is happy. She's really happy now that we don't have to prop the oven door shut with a broom handle. Thanks again. open the door, lock in the door locks, push up gently but with pressure on the top of the door like your closing it, problenm solved. Does have to be redone every so often. Thanks Jamie! I was a gas appliance technician and then engineer for many years and had to go into the field and make fixes to rows of water heating appliances under buildings because of simple mistakes engineers have made and other various coverup mistake fiascoes. This worked like a charm and brought back old memories. I am in the healthcare field now and have to do the same for doctors mistakes on occasion ;). I am not sure I will buy Bosch again in the future but time will tell. Hi, Jamie. I'll add my kudos to the all of the rest on this site. My Bosch oven door was leaking heat like Congress spends money and the heat had actually damaged the stove top knobs. I found your fix and the door is now snug and tight as it should be. Thanks for posting this quick and easy solution. It took me about 20 minutes to implement and saved me around $500. The beer is on me when next you're in St Louis. My wife is floating on a happy cloud still. Great work around. I used 2 small hex nuts. Thanks for this post! We just found our door ajar. First thing I noticed was that the locking arm at the top had been bent up above the whole in the door. I bent it down and still the door would not close properly. A quick google search and I found your advice with pictures! We're cooking now, so I'll fix it later. Thanks again! The fix worked. I also used the idea from others to superglue the washers in place to make reassembly easy. instead of superglue, just try to put scotch tape around the washers to hold them in place. You can easily puncture the tape when installing the screws. I recommend this instead of superglue, because it'll make removal of a washer easier. I put 3 on each side and found that the fit was asymmetrical; one side needed 3, the other needed 2.
thank you, thank you, thank you. Saved me lots of money and hassel! Thanks for posting your solution. What a great help to know it wasn't just us. What diameter are the spacers? In the picture the washers look very small and i was surprised to see how large the hinge screw was when i took apart the door. It looks like about an inch to me perhaps? The spacers go over the screw and sit at the end of the screw next to the hinge correct? I am a bit outside of my normal home repair aptitude which normally stops at about toilet handle repair, changing the air filters, and in extreme cases a garbage disposal replacement. Thanks again. I have a bosch range with the same problem. I have not added the washers but I did see a post on another website that helped. I took a broomstick, opened the oven door and placed the broomstick near the hinge to act as a lever. I then closed the oven door, and applied a slight amount of pressure to close it. This essentially fixed the problem for a few months. I now do it regularly and it works. This was an extremely useful post. I have the Siemens version of this range. I called "customer service", who gave me 2 repair shops in my area. +parts if any were needed...which would probably be 2 hinges and a new inside part of the door....which is $490 just for the parts. I canceled that service call, and bought 30 cents worth of washers, with great success! AMAZING! Thank you for this post. Shame on Bosch for doing wrong to all of their oven customers. None of us will ever by a Bosch again. I've looked for a fix several times over the last couple years, but finally found this. I wish I could have found a way to use a C-clamp as that is one of my favorite ways to repair broken gizmos, but I'll settle for using several circular punched shims (engineering term for flat washers). Works Great. Thank You for posting the fix!! 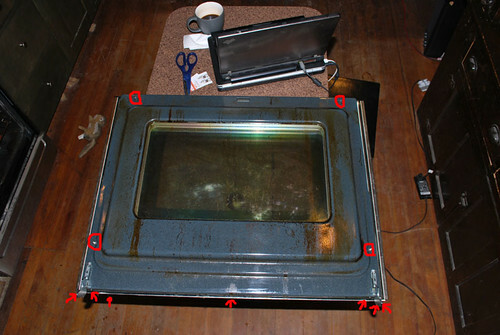 I had already shimmed up my oven's door hinge before your great post on the topic was found. 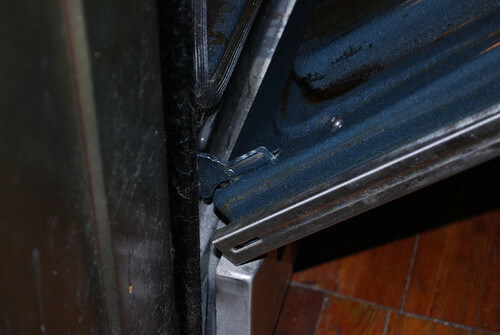 Due to the hinges' sturdy appearance, I think the root problem lies with oven side of the hinge connection, and not the door side. One of your anonymous posters said, "open the door, lock in the door locks, push up gently but with pressure on the top of the door like your closing it, problem solved. Does have to be redone every so often." I tried that, and sure enough the door now closes completely. You are a good person! The world needs more people like you......willing help others! Your advice worked like a charm, and my wife is thrilled. Now we will be baking with pride in 2012! Well, after (not) dealing with this door for about 2 months, it was time to take action...didn't bother with the customer service route, since it appears that Bosch doesn't know anything about that. My boyfriend fixed the door hing issue in about 2 minutes -- sure hope it holds out. The knobs, however, are another ball of wax..in fact, that's kind of what they look like now...and guess how much they want for these little pieces of cheap plastic ??? $69.99 EACH... no, you didn't read that wrong!! For a set of 4, hmm, maybe, still way overpriced, but doable, but EACH?? COME ON!! So, we checked out a knob that will fit, and a Samsung stainless steel knob that looks 100 times better may be a possibility, but now it's just a matter of finding them somewhere...Lucky for me I didn't pay for this range - I won it in a contest, now I see why!! OMG, thank you, thank you thank you!!! We have been wondering what to do about this problem for months! I debated about calling a repair man but after I did a little research on the internet I got the impression it wouldn't do any good. So I printed out these instructions and presented them to my husband. He thought the idea was sound. So, this morning we decided to give it a try and BINGO!!! It worked like a charm. I'm so grateful!! I no longer have to worry about the light in the oven staying on when I walk away or all the heat escaping before dinner is fully cooked!! I couldn't be happier. Thank you so much for your advise we so appreciate it!! Just did this repair, I used 3 M5 washers on each side, and the door shuts 98% now. There's a tad of give at the top of the door when I press on the handle, but that's probably just the door seal being compressed. Was really an easy fix--now I don't have to use that ratcheting strap to hold the door closed anymore! I'm just glad I didn't pay for this oven, it came with the house. Hey, thanks, for taking the time and effort to post this fix. You have saved many people, including myself, time and money. Your pictures are clear and concise. Thank you for a simple, elegant solution. Also in the process I found out where those screws in the warming drawer came from and that my stove was assembled with two left hinges. Thanks a million for putting this up on the internet. I was contemplating forking out money to fix our oven door, money we just do not have. Was nearly in tears at the prospect but your post really helped. The door is even better than it was before we broke it!!!! Thanks Jamie for solving a problem that Bosch should never have allowed to occur. Of course, it worked perfectly. Thank you, Jamie! I added a small washer (1/16") to each hinge to fix this annoying problem. It's a miracle! To be honest, I was not expecting this to work but we thought we'd give it a try before calling in an engineer. It took us about fifteen minutes, which included my husband running in and out of the garage. If ever you are in the UK, the drinks are on us - thanks very much. My husband NEVER posts anything but all he can say is AWESOME! He followed you instructions and never a curse word was heard. It works!!! Thank you, thank you, thank you! My hubby doesn't even know how to hold a screw driver so I'd have to do the job myself...Mine has been bugging me for a year now and everytime I use the oven, I have to lean against the door the whole time! This week it got worst, the oven light would stay on. I'll try to attemp this myself next weekend and will definitely leave feedbacks, as a woman, I'm sure it won't seem as easy! I just followed this procedure and it worked perfectly. Thanks so much for posting it! Worked perfect !! Thanks. I have been trying to bake bread and it is simply impossible with the gap because the oven would never get to temperature. Posted above after doing this in January 2012, and it worked great. Now it's late September 2012, and the door has come loose again. I'm going to add more washers (currently have three each side), may need a longer screw, I'll have to see. Also saw a post somewhere where someone added a snap latch to side of oven, clamps on slot on side of door, clamps it shut. Looks like a Bassick HR-1 snap latch. Having trouble finding one of those, but it's my next step if the additional washers don't work. After adding washers a year ago, the door doesn't shut tightly once again. I added additional washers to fix the problem. I found a shortcut this time around. I only removed the 7 lower screws and the 2 hinge screws of the face. I slipped each hinge out after carefully lifting the interior panel. Tapped an additional washer to each and reassembled. Added the additional washers as noted a couple of comments above. Now up to six M5 washers on each side, and had to change to 20mm M5 bolts from the OEM 10mm bolts to take account of the additional spacing. Oven door is nice and tight now (of course, it was nice and tight back in January when I'd just added three washers to each side. Guess I'll have to see how long the fix lasts this time. Yay! Different Bosch model, different hinge, sane solution. Only just done it, 15 mins and all sorted. Thank you so much. Purchased our home a little over a year ago, and noticed the problem with the oven door almost immediately. I thought it was supposed to be like that until it got worse. Used your fix last night because I refused to believe that I need to replace such an expensive piece of equipment. The fix worked, and now I know what to do if it happens again. Thank you so much. Now I just have to spend the obnoxious amount of money to replace the stove top knobs that were damaged from the heat leaking...but they work for now even if they are not aesthetically as pleasing as I'd like. Thank you again! Incidentally my Bosch oven is 12 years old and other than a new element and fan is as good as new. I used three M6 washers on one side and four on the other,holding them in place with masking tape. Had I not seen this blog, i'm not sure if I could have come up with the solution, so many thanks for that. 3-year update: some early commenters wondered how long this fix would work. I am still working on the original fix and the door is still quite snug. The last commenter gives a very believable explanation as to the physics at work and why this happens in the first place or might fail again. Perhaps the pin can only bend so far in the way this is set up on the Bosch and in my situation it's reached that point. But I have not had any further trouble since I originally posted this fix. Thanks for the info! Worked great and yes only took about 15min. I secured the washers with masking tape so they held in place prior to replacing screws. My client had 4 people previously come out to attempt to fix the oven door but failed. I have never worked on an oven door and fixed it in 15min. She was ecstatic! Thanks again! Worked perfectly! Thanks for the information. I have a Bosch microwave, dishwasher, range and fridge. I've had to replace the fridge twice due to a bad icemaker, the dishwasher doesn't get dishes clean, the range had a bad ignitor, now this. As you can imagine, I'm not a Bosch fan! What a relief. I used 2 washers that totaled 1/8 inch exactly and problem is solved. Perfect fix thanks, managed to get it sorted before the knobs melted with thinner washers. It save me $200. Thanks for solving the design flaw with the Bosch door. It works like a charm and my oven door is finally closed tight. I uses three number 8 finishing washers on each side of the door. they are cupped so they stack, and they even fit the buldge in the door. After that I aligned the door by adjusting the screws on the hinge. It took me longer to find washers than to fix the door. You made my day. Did exactly as you described and — it worked. Perfectly. Thank you, Thank you, thank you. Happy 2013.
we installed this unit in 2009 and have fixed the hinges 3 times. we were going to finally bail on this and just buy a new stove after we needed to use a bungie cord to hold the door shut. i did a bunch of research on fixes and it turns out that Bosch has admitted that there's a problem and has recently created an official repair kit for this. i bought one and installed it in 1/2 hour. basically it's a new door and with hinges. you keep the original outer skin and handle, the kit comes with everything else. it's pretty much pre-assembled and it was a piece of cake to change over. the hinges have been redesigned and are much beefier as are the hinge mounts. the best price i could find was $170 which is actually cheaper that replacing the hinges alone. here's a link..
finally a cure - we'll see how long it holds up. Brilliant fix that cost 4 cents and 10 minutes. You should post this on www.instructables.com. Thank you! Thank you very, very much for this detailed breakdown! Worked like a charm and saved me tons of nerves and cash! Thank you for taking the time to post this. My oven is a Thermador Professional DP304CS, which is made by Bosch. We've been dealing with this forever, even once having the hinges changed out, which didn't fix the problem. Finally we can use our oven without waiting 30 minutes for it to heat up (and heat the whole kitchen)! Worked awesome! Thank you! Was also able to clean glass front door...much needed! I have my oven back! So easy fix..can't believe we lived with it for so long for such an easy fix..thanks again! Step 2: Call Bosch and tell them you have been having the door problem since you bought it and want fixing kit that was designed to correct the manufacturing flaw. They will ask you to send a copy of your receipt for the stove. When they agree to cover the parts only tell them to send the order to the shop you have an agreement with for carry in service. I used Jamie's fix years ago but it eventually failed again. The fix kit has reinforced steel plates tack welded to the inside of the liner where the hinges attach. You can buy kit and do it yourself $175-$211. Or Have Bosch cover the part and do an in home repair $160 labor around here. Or what I did for $50 carry in repair. "We are sorry to hear of the issue you are experiencing with your range and apologize for our delayed response." "In reference to your inquiry, please be advised there are no known issues or recalls for your model HDI7282U/03 range." How could they not know of any issues if they have offered the kit to other customers? Very frustrating to feel left in the dark by a company. Thank goodness for you and this post. We used the 2 washers on each side and have contact with the gasket! I tried the magnet fix and it worked great, so wanted to pass along the details. I ordered 10 Neodymium Magnets 1/2 x 1/8 inch Disc N48 from amazon which cost $8.35 (plus shipping) ... i ordered from bykes technology but i'm sure it doesn't matter. then i just stuck them on the door -- stacked in twos. I put two on each side near the top and three across the top. I thought I'd have to superglue one side but that doesn't work and doesn't matter. the magnets are super strong and are hard to separate, and jump right onto the oven. The door is not too hard to open but a bit of a tug, and then snaps closed real tight. Made some bread today and it worked great. Still maybe a bit of a leak? but SO SO SO much better ... and this is cheap and easy! I inherited a bosh stove (along with fridge, microwave, and dishwasher) when we bought our house two years ago. I very quickly noticed the issue with the range door and implemented your fix. It did work very well, but the top of the range still gets very hot. I have to keep my young daughter far away as even when I just have the oven on, the stove is so hot she would burn herself. Too bad I cannot find the knobs to replace where the heat melted them. We've lived in our home two years and are now having issues with the freezer component of our refrigerator not holding temp. Our appliance repairman said he's had several calls regarding the same make/model and found out the control boards on the Bosch refrigerators are going out. His company has 5 on back order already. Unfortunately, I do not have a receipt for purchase of the appliances and therefore have no recourse regarding warranty or company responsibility at all. I was so excited to get these as part of our home purchase, but after our experience the last two years I will NEVER purchase a Bosch appliance (except maybe the dishwasher-it is very quiet and does a decent job). We have a Kenmore Elite fridge in our garage that is about 10 years old, purchased off Craigs list for $400 and works better than the Bosch! We also bought one of these in 2007 and had 1 warranty replacement unit, multiple replacement hinges and replacement doors (and knobs!). Post-warranty we tried the washer fix multiple times but now have so many stacked that the bottom of door gaps. We now use a strap to keep it shut or get self-clean going. I tried calling Bosch to ask about this fix you highlighted in April 2013 and they told me they have no redesign and they have lots of the same units w/o complaints (do they ever bake?!). As a mechanical engineering professor, I think I may use this as a homework problem exemplifying poor mechanical design. How did anyone think that poor door liner could transmit the cyclic torque loads of the door/hinges, esp. at high temperatures, without deforming. It is not the hinge that fails, it is the sheet metal door liner that it bolts onto. It has one small 3D feature intended to give it out of plane stability. This is really a ridiculously bad patent defect in their engineering. we also have a door hinge problem with our Bosch HBL745AUC model built in electric oven. does anyone have experience as to whether this "fix" can work on that model? Go to you tube and look up How to repair an over-extended Bosch oven door. It took me all of 30 seconds to do this. Hope this helps some of you with this problem. Hey -- the 30 second fix on YouTube worked for me! Same problem about 3 years in...no help from Bosch. Just a suggestion to avoid tape or glue (neither of which I wanted in the heat). Place the inside door panel with the inside surface facing down on a counter surface. Put it such that the screwhole is overhanging the edge. Put the screw in from the bottom and hold in place with torx driver, place the washers over, and lower the hinge onto the screw. Now tighten the screw. Voila! It's the year 2013 and this problem still exists and this solution still works! The only problem was the handle was a bit of a $*&%#$ to get back on. Thanks for the post - totally worked!! Say, is this a legitimate fix? I would say yes, but. But it will only be temporary. The root cause of the problem is the hinge moving and therefore changing the leverage of the hinge. Adding shims / washers changes the linkage more permanently. Just wanted to let you know that after dealing with a sagging oven door for seven years, even trying to fix it by buying replacement hinges, I used your washers fix and it did the trick. Thanks! Thanks for the Hack. We suffered the non-closing door for nearly a year, but with your guide I was able to fix this in less than 30 min. You should leave your acct information, ask people to send you 1/10th of what they saved - if each sends you $20 it would be great recognition. I wish I had seen your post before calling a repairman to replace the oven door hinges, $400 later for parts and service. I've exchanged emails with Bosch, provided them with receipts and still they refuse to acknowledge a problem or reimburse me at least for the part. I will never buy a Bosch appliance again and inform everyone I know not to as well. I hope Bosch reads this and takes note. My stove fix is lasting about 6 months. I just got off the phone with Bosch service. I have ordered the "Fixing Kit" Part number: 687665. A bit expensive at $200; I happen to be a Bosch employee, so I get a nice employee discount. Lucky for me. It should ship in a week. I will let you know how it goes. It would be great if this problem is finally solved. 5 years later, and your post is still helping people. Just fixed our stove using this method. Thank you!